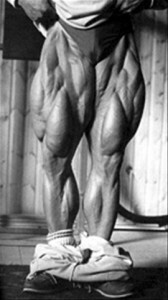 As Dorian Yates said in an interview given this year at Mr.Olympia 2009, “legs training is what separates guys from men”. And he is right as leg training is one of the hardest training we experience.When it comes to leg training day many find excuses to avoid training others come and are not fully squatting(if they are squatting at all) or are not performing all reps or sets. The list can continue but one thing which is common for these guys is the fact they do not fully realize the potential they have this resulting in tiny legs and medium muscles mass. In the same time mens who came serious to leg training are not avoiding leg training but are looking for the ways to make it harder, thus more efficient. We will not discuss anymore importance of leg training as this can be read here and we will move to the subject. This method was elaborated by MusclesProd.Com Team and has something taken from German Volume Training Method but it is harder. Are you ready to get bigger? Let’s begin! Leg extensions 5 drop sets with 10 reps each. Put 5 iron weights and do 10 reps then drop 1 and again 10 reps and drop 1 more so totally it will equal to 5 sets 10 reps each. And finally we are doing Lying Leg Curls for Thighs in 4 sets 15 reps each. This will shock your legs and you soon you will need new jeans because of the size of your legs. Leg Curls 4 sets 15 reps each.